I had no intention of making Rice Krispie Treats today. I had better thing to do with my morning – buy Rush tickets, call the Salvation Army to find out why the heck they didn’t show up yesterday, work on my Food TV contest recipe and most importantly, provide a load of cookies for “All May Staff Birthdays” at the school. I’d made at least three varieties of cookies to take to the teachers. As I was piling them onto plates, I noticed I had two single Rice Krispie treats lying around from last week…. the ones I used for pictures. They were in a zipper bag, so I just threw them in the pile and headed down to the school. I was plating cookies in the teachers’ lounge when two teachers came in, eyed the Rice Krispie treats and thanked me profusely for bringing them. I apologized for bringing only two, but the ladies didn’t hear me because they were too busy picking off the Reese’s pieces (neither of them liked the flair, I guess) and taking bites. As I headed out the door, I remembered that I did indeed have a box of rice cereal and a bag of marshmallows at home. 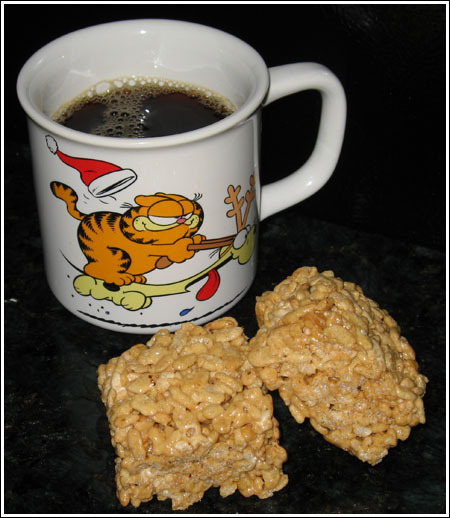 How long would it take me to make a batch of Rice Krispie treats and get them back to the school? Well, counting cooling time (I cheated and used the freezer) about 25 minutes total. During the 2 minute drive to my house, I thought I’d use this as an opportunity to try a new version of treats. A version created by coffee-infused version created by George Duran, who I am now convinced is a genius for coming up with this. Here’s the link to George’s recipe. I didn’t change it much, but I was heavy handed with the butter. I used 2 tablespoons of Folger’s crystals – any more that that would have been too much. Here’s a visual. Don’t worry, it dissolves. I dropped the treats off at school and continued going about my day. No reviews from anyone else, but in my opinion, these are very good. Thanks for the feedback. I wasn’t sure if anyone else had made them. Glad to hear you liked them. 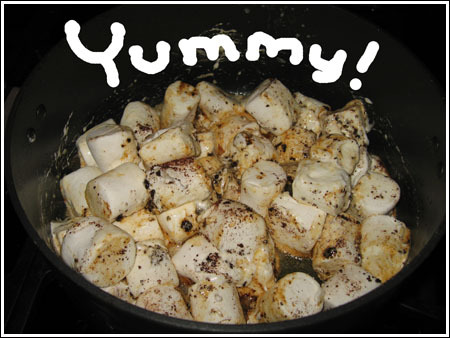 those marshmallow cubes/poppers look melt-in-you-mouth delicious! George Duran’s old show made me laugh a lot. I love the episode about chocolate when he had people in a mall trying different types and he called the unsweetened “100% Cacao” and people thought it would be great … funny faces all around. 🙂 Didn’t he make the coffee rice krispie treats on a Cab, or was that something else? Okay I take that back. Fried Oreos and fried ice cream are sort of like that. But I’ve never seen fried chocolate chip cookie dough. I made them the first time I saw him make them and remember them being wonderful. He is a genius sometimes with his clever twists on recipes! Anna, I just saw your name and picture of the grand prize winning bar recipe on the BC website! Congratulations!